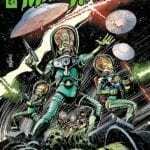 IDW’s Mars Attacks: Occupation concludes this Wednesday, and we’ve got a preview of the final issue for you here… The Martians came. The Martians saw. The Martians conquered. Now the space invaders cruelly rule over humanity, but Ruby Johnson has something to say about that… Mars Attacks: Occupation #5 is out on Wednesday, August 17th, priced $3.99.